Ding dong! You answer the door on Halloween, and what do you see? Is it a tiny ninja or a bitty ballerina? What we have here are a bunch of Big Kids. They've clearly outgrown any interest in pretending to be superheros or princesses . . . but they haven't yet outgrown their love of candy. This results in a ridiculously low amount of effort being put into the evening - the least effort humanly possible, really, while still attaining their ultimate goal: going home with a huge sack of sugar. If you open your door this Halloween and there's any question about whether or not the youngsters you see fall into the "Come on, now, shouldn't you be at home doing your trigonometry homework?" category, here's a graphic to help you out. Labels: A Cry For Help, children, holidays, humor, List Lover, pet peeves, They Grow Up Too Fast, What did you say? Exactly. If you can afford the liquor in the flask of your "bum" costume (dirty clothes you found on your floor,) you can afford to go buy a Baby Ruth from the store. This is why I turn my light off at 9pm. And, well, because I go to bed by 10 pm most nights. It really irks me when they come by bus!! The only time I would find that acceptable would be if the bus somehow managed to get in a freak accident with the ice cream truck. Takes care of two annoyances, plus I could volunteer to "clean up" the suddenly candy-covered ice cream. I agree, although I guess now I feel like I should be grateful that they aren't trick-or-treating for my liquor. Maybe I should actually get a drink from them when they come around - a Twix-for-a-swig exchange program sure would make the night more interesting! Yeah. My friends' parents used to come to our house and all do Trick-or-Beer. Good times. 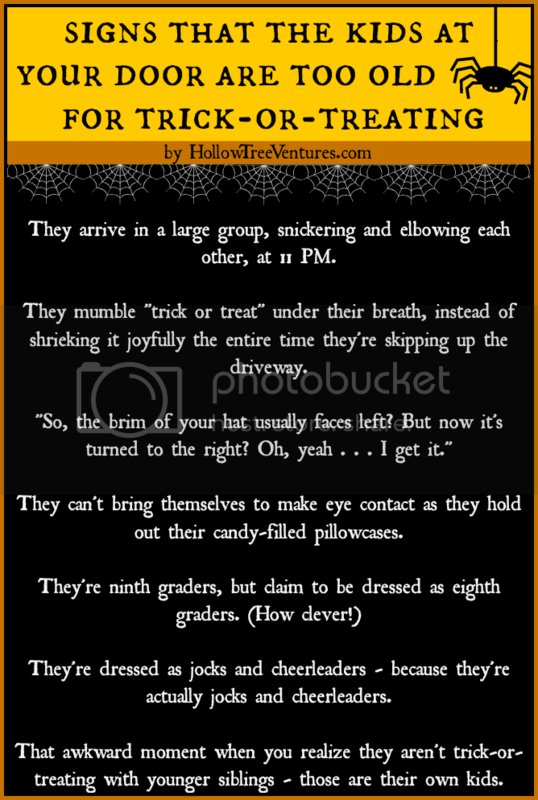 You need a follow-up post of things to do/say when "kids" who are clearly too old to trick-or-treat come knocking! If any children try to knock on my door at 11 pm, I shall fling flaming dog poop at them. There isn't a single home owner who would blame you. Good point! I'm afraid to give my half-grown children sugar because of the sugar rush fallout; I can't imagine giving it to a baby! I feel quite certain most of that candy gets "tested for safety" by the parents - of course, that's what I do, too. Can't be too careful! Some of these are funny, but as a mother of an autistic child who struggles with verbal communication, and happens to also look a lot older then he really is, I find the eye sight one and the "mumbles" one to be rude. Just because a kid isn't acting or reacting a certain way, please do not judge them because you never know what they are going threw. My sincere apologies, Dannielle, for any offense - this was certainly meant as a joke, and I hope no one reading it takes it as an indication they should ever judge a child, autistic or not. I do understand that it was meant as a joke, and thank you for the apology. I wasn't trying to be one of those "mom shamers". I just wanted to try to bring a little awareness to the fact that some children, like my boy, have difficulty communicating their excitement or appreciation. There's something I found online, and for the past couple of years, I've posted on FB just as a friendly reminder.